What is a Poster-Pamphlet? It is a beautiful work of art that promotes a Baha’i theme or principle — that also has a whole pamphlet’s worth of quotations and introductory material on the back. 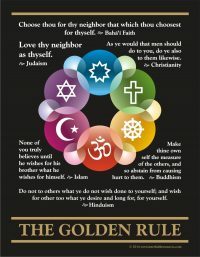 People accept the poster as a generous gift, then read what is on the back before putting it up on their wall, refrigerator, dormatory door, office bulletin board, or children’s room wall. 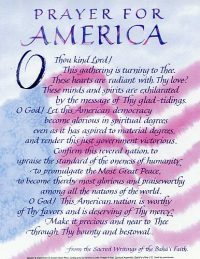 The Story of Poster Pamphlets: The very first product I created back in 1981 was the United Doves Poster/Pamphlet, and within a few years it had revolutionized the way Baha’is gave away literature. Before then, communities would be thrilled if they gave away a few dozen pamphlets at a county fair or college campus literature table. By offering people beautiful posters with information about the Faith on the back, they were soon giving away thousands of pieces of literature. The unexpected bonus was that once people were attracted to the table, they not only read the back of the poster, but they also picked up hundreds of additional pamphlets, booklets and invitations. With the introduction of stickers and teaching cards, poster/pamphlet sales started to slow. So this year, as the Community returns to more active teaching, I wanted to remind people of the advantages of giving away something that not only contains much more information than a teaching card, but is also more likely to be put on a wall and looked at for years to come. I cut the prices of many of my beautiful posters to encourage you to give them another try.